Today we are travelling north to the Freycinet Peninsula. 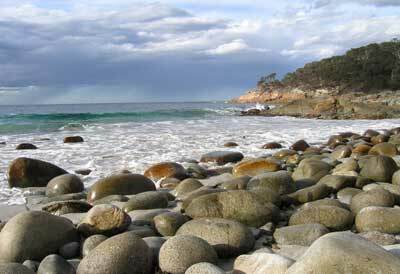 When I originally planned this trip we were going to stop at Maria Island and perhaps even do some dives in this area. 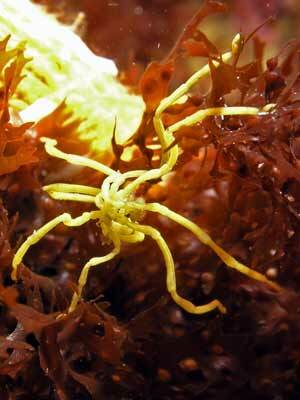 However, the dive operator has a useless web site and did not respond to emails. Not worth diving with I reckon. The original Maria Island ferry operator stopped operations in August 2007 and the temporary replacement is charging $50 a return trip compared to $25 the old operator charged. As I do not think that this is good value (you only get about 5 hours on the island), we have decided to by-pass this spot. We get up at 8:30 am and it is cool (8.5ºC) and drizzling. We leave at 9:45 am At 10:20 when we pass by Eaglehawk Neck it has dropped to 7.9ºC. 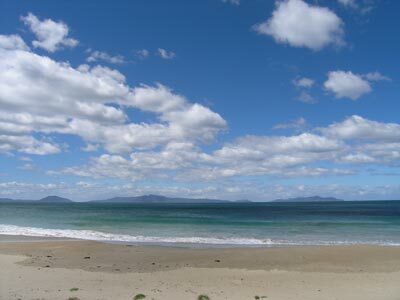 We head north and just north of Dunalley we cut across to the main road that follows the east coast, the Tasman Highway. 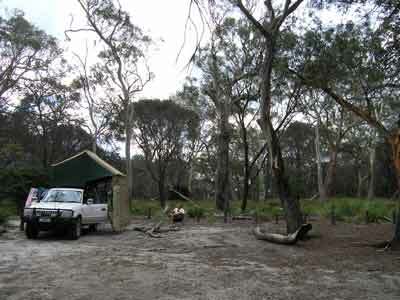 We go via Marion Bay and 50 kilometres from Eaglehawk Neck we come to Sandspit Picnic Area in Wielangla State Forest. This is very nice, but it looks like it has not been used much lately. There are undercover rock walled sheds, barbecues and water tanks ("wallpapered" with rock) but no toilets. We stop here at 11:10 am and have morning tea. 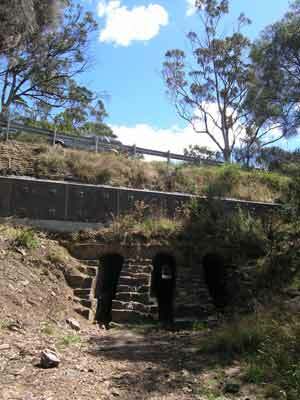 Just after leaving here, about 100 metres down the road, we find an interesting feature. We park the car and walk back to the bridge we have just crossed. This is called Robertsons Bridge. It is totally made from huge timber logs. There is a track leading down the western side and you can get right under it. I could at least 12 layers of logs creating the bridge. I cannot help thinking what a waste of good timber this was. There is also a 15 minute rainforest walk here. We continue on and at noon we arrive at the Thumbs Lookout. 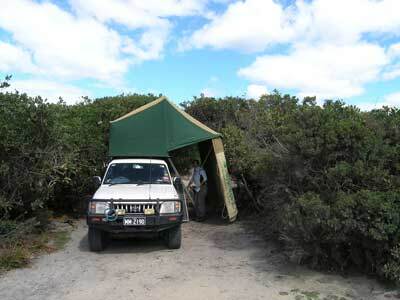 There are very good views to Maria Island and Triabunna and a nice picnic area with tables and shelter. At 12:10 pm we came back onto the Tasman Highway at Orford (an IGA supermarket here) and turn right to continue north. It is still a cool 12ºC. We decide to stop at Triabunna for lunch but it is very small and not much open (it is Sunday). The hotel on the highway advertises lunch but does not have any since it has no chef. We drive around a few times before going to the wharf area and where we find a caravan that sells seafood. We order fish, calamari and chips and have it outside the Spring Bay Hotel next door with a beer. Nice. We head off at 1:17 pm after stopping here 45 minutes. At 1:45 pm we come to the Mayfield Conservation Area. 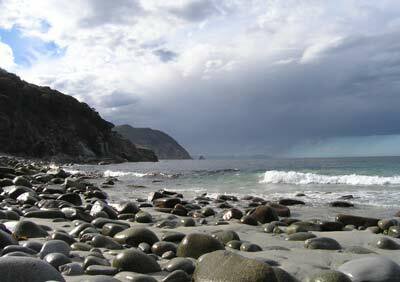 This is right on the beach and has some nice free camping sites. 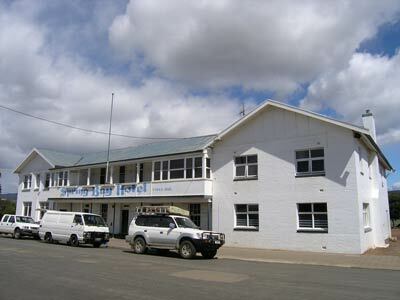 If we did not have to be in Bicheno tomorrow morning early (still about 40 kilometres away) we would have stayed here. 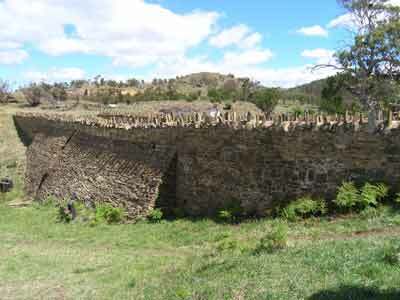 There is a convict built bridge here call The Three Arch Bridge. It is now covered by a lot of earth and the highway but you can still see the arches. Eight kilometres further north is the very strange looking Spiky Bridge. 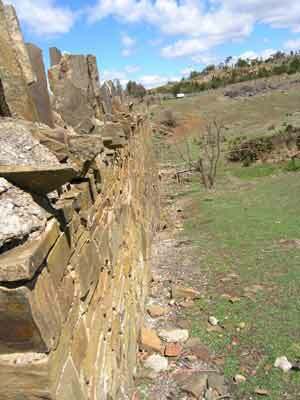 This was also built by convicts and is all local rock. The funny thing is that it has hundreds of spikes made out of rock pointing up out of top of the walls for some unknown reason. We get to Swansea at 2:14 pm and leave at 2:30 pm (for the life of me I cannot remember what we did there now). We take the turn for Freycinet National Park which is about 32 kilometres along the road and then the turn left to Friendly Beaches. This is closer to Bicheno where we are diving tomorrow so it will be more convenient. As it turns out, it is a very nice spot. At 3:15 pm we arrive at the camping area. This is pretty large and set out behind the beach in the heath. Most of the sites are isolated from the adjoining site by heath and this makes them quite private. It is still windy but the sun is coming out now and again and it is 19ºC. We find a nice spot near the northern end of the camping area which is right near the access to the beach. We set up camp and Kelly has a nap as she is not feeling the best. After, we go for a walk along the beach. There are some nice waves and there are a few surfers. When we arrive back at the camp we have another echidna wandering around the sand at the back of the car. I follow it for a while till it eventually disappears into some bush. There is a toilet near here but it is in poor condition, rickety and smelly. There is another further south that we decide to use. Kelly cooks lamb korma curry and rice. After dinner we go for a walk past all the other camp sites and see a few other vehicles that we have seen at other spots. We go to bed at 9:00 pm and read for a bit. Today we head to Bicheno for some diving. We are up at 7:30 am and gone by 8:10 am. There are lots of pademelons and small kangaroos around as we pack up. The plan is to do two dives here. We drive the 25 kilometres to Bicheno, arriving there at 8:35 am. This is a great dive operation and the owner, Bruce, is a laid back sort of bloke. We gear up at the shop and put our equipment on the boat which he then tows the short distance to the boat ramp. Meanwhile, we jump in their Falcon and are driven to the ramp by the dive master. Like Eaglehawk Neck, the dive sites are very close to the boat ramp and it is no more than a few minutes run in the boat to the dive site. There is a bit of swell running after the last two days very strong winds. The first spot is too rough and we end up going to The Steps. We do the dive but unfortunately the water conditions are not the best, at one time all I could see was a few metres in front of me. Nonetheless, it was a good dive. Click here to read more about the dive. After the dive, Bruce is very apologetic about the conditions and says there is no point doing another boat dive today. He says that after lunch we can do a shore dive with his dive master. We return to the shop and change back into our clothes and then walk into town. We walk to Rose's Cafe and have toasted sandwiches and milkshakes for lunch (very nice food). We are back at the shop at 12:30 pm to gear up for the shore dive. This is from the concrete breakwater for what appears to be the old harbour. We drive down in their Falcon. 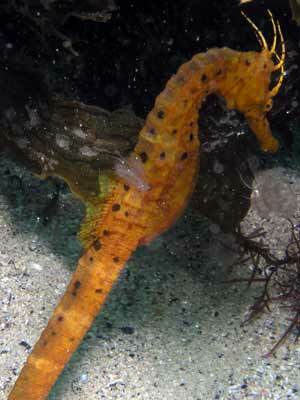 This is a great dive, with plenty to see, including sea dragons and sea horses. Click here to read more about the dive. At 3:00 pm we leave the shop after washing our equipment. I want some a Devonshire tea for afternoon tea and we go back to Rose's Cafe. I broke my thongs this afternoon so I also have to go to the hardware store to get some new ones. 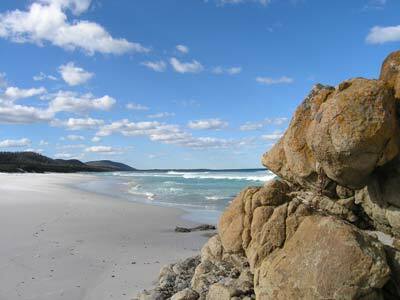 We leave Bicheno at 4:00 pm and drive back to Freycinet National Park for the night. Some diving friends have told us of another camping area that is not often visited. 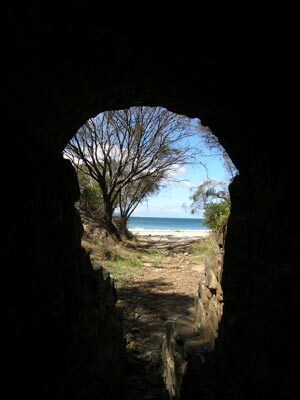 It is called Bluestone Bay Camping Area and is located out near the lighthouse. We drive to Coles Bay and have a look at the camping areas here and pick out which one we prefer for tomorrow night. After this we drive up the lighthouse road and we miss the turn off to Bluestone Bay. We saw one track about 500 metres before the lighthouse and go back to it. About 100 metres down the track we see a sign that says simply Bluestone Bay and 4WD Only. It is not a 4WD track, any car could make it down easily if driven slowly. We end up at the bay only to find it says no camping is permitted. We go back up the track a bit and see another track off to the left (right as you come in) and a little bit along is a sign saying Bluestone Bay Camping Area. Very slack of national parks if you ask me. There is only one other car here, so we will have the pick of the sites. Kelly suggests having a drink and nibblies on the bay so we drive the short distance back and have a beer and some camembert cheese and biscuits on the rocky shore. It does not get much better than this. 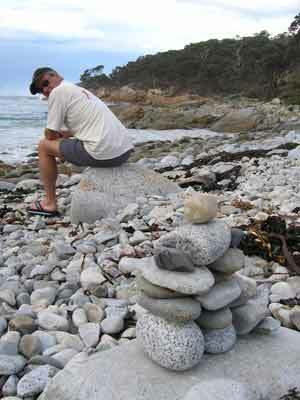 Kelly decided to make a rock art sculpture here, piling some rocks on top of each other. After the beer we go back to the camping area and set up camp. Fires are not permitted anywhere in Freycinet National Park so we have to cook our barbecue on the frying pan. There are some possums, a baby kangaroo and some blue wrens (male and five females) and another bird, blue with a red chest but we cannot identify it. It was a warm night till about 8:30 pm when a southerly hit and the temperature dropped to about 16ºC. During the night it was so mild we had to keep Kelly's window open.